Vilhelm Hammershøi (1864-1916) was a Danish painter best known for his low-key, soft portraits and interiors. Enigmatic and secretive, his paintings were described as “highly traditional, but also distinctively modern” in the 2008 London Royal Academy of Arts’ exhibition, Vilhelm Hammershøi: The Poetry of Silence. Not as well known are his landscapes, simple, often grey, and usually devoid of people. 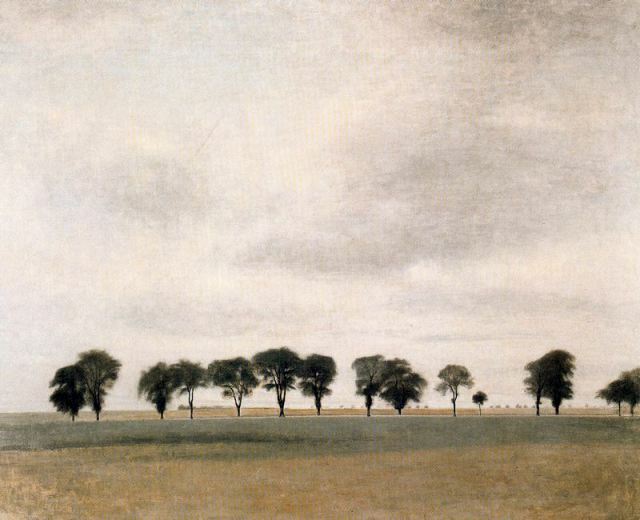 Groarke’s poem captures and mirrors Hammershøi’s “illegible fields” and skies devoid of promises.